Halloween ghosts, goblins and ghouls will be roaming the streets on October 31st. 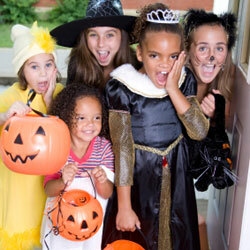 Here are some easy-to-follow tips to make sure your little trick-or-treater is safe. Make sure your child is dressed in a costume that is: bright, easily visible, a proper fit, comfortable, and does not cover his/her face (use hypoallergenic, non-toxic make-up). We recommend that you put reflectors on your child’s costume. Costumes should be made of fire-resistant material. Make sure that the costume is not a tripping hazard. Do not use sharp objects as part of the costume. Screen your child’s bag of candy. Throw away candies and other foods that are not in wrappers. Keep hard candies and other small items out of reach of infants and toddlers. Supervise your child around lit pumpkins and never leave your lit pumpkin unattended. Use flashlights instead of candles in the pumpkins. Supervise your child as he/she crosses the street. Make sure that children have adult supervision when trick-or-treating. Encourage a buddy system if your older child is out trick or treating alone. Trick-or-treat in familiar neighbourhoods at homes that you know. Teach children to stop and check for cars at driveway entrances, street corners and alleys.